"There is no problem, I tell you, no matter how difficult it is, that we cannot resolve by the prayer of the Holy Rosary. With the Holy Rosary, we will save ourselves. We will sanctify ourselves. We will console Our Lord and obtain the salvation of many souls." --Sister Lucy (of Fatima) December 26, 1957 A.D.
“I have left you my Mother: it is she who, every day, brings me your intentions, your tears, your joys. In Heaven, she is always standing: she watches and looks over her children on earth. When she sees your tears, she cries; when she sees your joys, she smiles. Ask Him to take you to the garden of His virtues. This will be under the dew of your Ave Maria’s. When you pray three per day, the first in honour of her purity, the second in honour of her humility, the third in honour of her charity; even if you have done only that during your life, I will recognize you as the blessed children of my Mother and I will receive you in Heaven. “My dear victim-priest, (Fr. Chrysostom, superior of the Franciscans of Orleans) Oh! The Rosary and the “Hail Mary, full of grace,” moves all of Heaven. Preach this: it is a benediction which comes down from Heaven, to calm the rigours of the justice of my irritated Divine Son. I make all effort to appease His anger; but the multitude of offenses have become so great that I cannot tell you, my children, what I will be able to do when the measure [of sin] becomes full. [Source: pp. (p. 117-118), Le Ciel en Colloque avec Marie-Julie Jahenny. Note: Jeanne Rialland is another of the devoted secretaries who would offer their services to record the daily ecstasies. We know nothing about her, except that, if she is included in Father Roberdel’s book, then she must have been considered reliable]. In this prophecy, Christ reminds us that He has given us His greatest Treasure, His Own Mother, the Blessed Virgin Mary. She looks over us and blesses our efforts here on earth. There is nothing that our Blessed Mother cannot help us to face and conquer. As we face the rumour of nuclear war with Russia, China, and North Korea, this prophecy reminds us of the Infinite Power of God, and of the greatest weapon which we hold in our hands, the Holy Rosary, as a means of gaining Divine Mercy. This is a great Mercy from God! Do we realize this Infinite Mercy towards our sin-filled souls? The Blessed Virgin Mary shows Marie-Julie the effect of praying the Holy Rosary: “Oh! The Rosary and the “Hail Mary, full of grace,” moves all of Heaven,” says Marie-Julie. 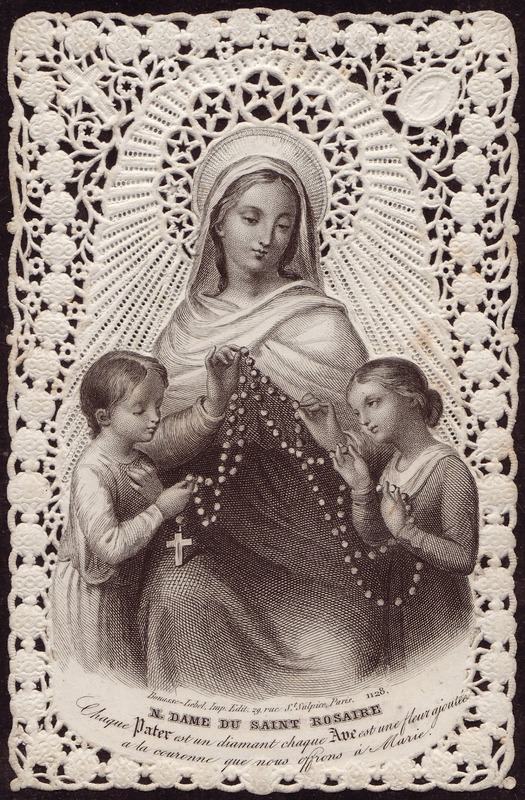 The Holy Rosary, prayed daily, is the way that we can show confidence in His Mercy in these days of tribulation. We will gain peace of heart and mind and soul, and we will lessen the sufferings of our Crucified Lord over this worldwide lack of confidence in His Mercy. May our prayers also serve to restore the confidence of mankind in Christ’s Mercy! Let us take our Holy Rosaries in hand and have confidence in His Mercy! Ave Maria, gratia plena, Dominus tecum! Benedicta tu in mulieribus, et benedictus fructus ventris tui, Jesus. Sancta Maria, Mater Dei, ora pro nobis peccatoribus, nunc et in hora mortis nostrae. Amen.